While several mammals make a good living in the ocean, dolphins possess several adaptations that make them among the world’s most successful sea-going mammals. As air-breathing animals, dolphins face -- and overcome -- challenges that fish and other water-breathing competitors need not address. Armed with sharp minds, social behaviors and echolocation, dolphins are some of the most effective hunters patrolling the world’s oceans, and they have carved out a very successful niche for themselves. Though their ancestors walked on dry land, dolphins have adapted well to an aquatic lifestyle. Dolphins have streamlined body shapes that are very hydrodynamic, allowing them to swim fast. 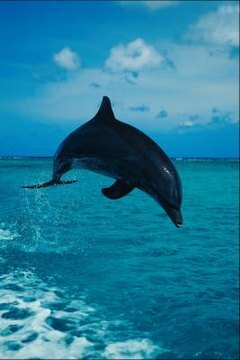 Additionally, dolphins have very tight skin and adults have no body hair, both of which help to reduce drag on the marine mammals as they move through the water. As dead or damaged skin cells may also cause drag, slowing their swimming speed, dolphins shed their skin cells rapidly. Dolphins can replace their skin every two hours -- nine times as fast as humans replace their skin cells. Dolphins primarily propel themselves by using their powerful tails, which are laterally oriented in contrast to the tails of fish. Their dorsal and paired pectoral fins help them to steer through the water. Like all mammals, dolphins must breathe air; while they can hold their breath for up to about 7 minutes, they must eventually return to the surface to exhale carbon dioxide and inhale oxygen. In contrast to many other sea-going mammals -- such as seals, otters and walruses, who breathe through a nose or mouth -- dolphins breathe through blowholes. Located in front of their dorsal fins, their blowholes are actually their nostrils, which have moved to the tops of their heads over evolutionary time. One of the most important adaptations of dolphins is their ability to use echolocation to learn about their surroundings. By making high-pitched squeaks, grunts and clicks, the dolphins can listen for the sound waves bouncing off objects around them. Their brains use this information to create a type of “map” that the animals use to move around, avoid obstacles and capture prey. While biologists argue about the exact hierarchy of animal intelligence, most would agree that dolphins are among the most intelligent animals in the world. Dolphins are very communicative animals that emit a wide variety of sounds to communicate with other dolphins. Additionally, dolphins have individual “voices,” allowing them to identify each other with sound. Their social nature and communication skills allow dolphins to learn from each other, and cooperate. Dolphin Communication Project: How Does Echolocation Work?